Hello and welcome! 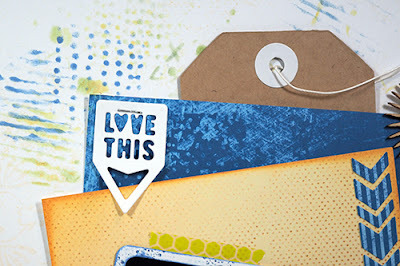 Susie hosting the blog today and I am sharing a layout I created using the new Mulberry Paper Pack. This picture of my boys is one of my all time favorites. I found them crashed on the playroom floor, snuggled up together amidst their dinosaurs and transformers. It melts my heart every time I see it so I decided it deserved its very own scrapbook page! Heat embossing is an easy way to add another little bit of texture and dimension to your layouts without adding bulk. 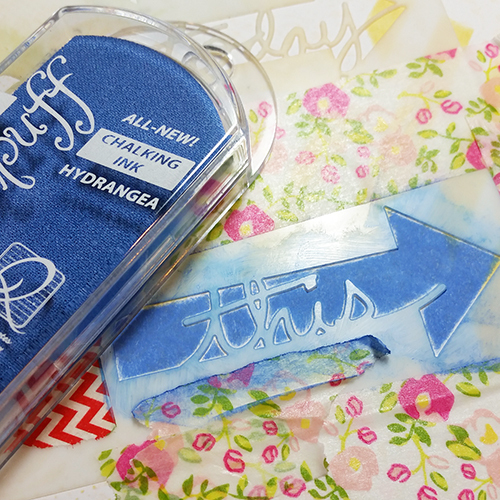 After the Hydrangea ink had dried I applied clear embossing ink through the stencil. I quickly removed the stencil, sprinkled on some clear embossing powder, then applied heat to set it. I love the shine! 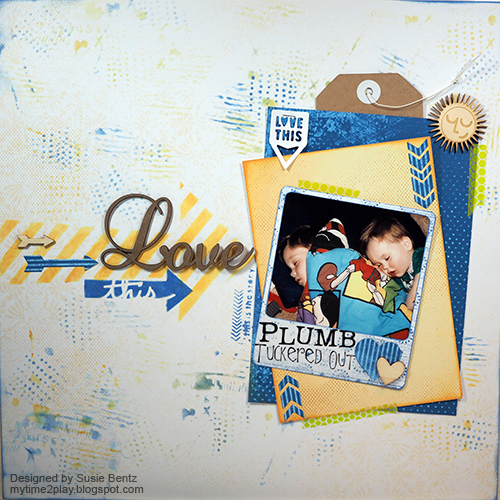 In the title area I added a Fancy Chipboard Word - Love! 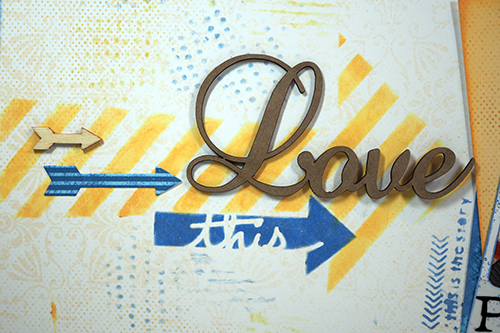 I also included a wood chippie and an arrow that I die cut from the blue stripe paper, MB101. 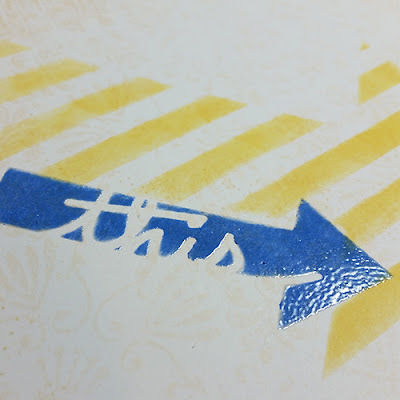 I used another stencil to create the texture in the background by moving it around the page, flipping and turning and layering the patterns with the different inks. Desert Sun was the perfect color to ink the edge of my yellow photo mat. I just love the instant depth you get from that one little detail! 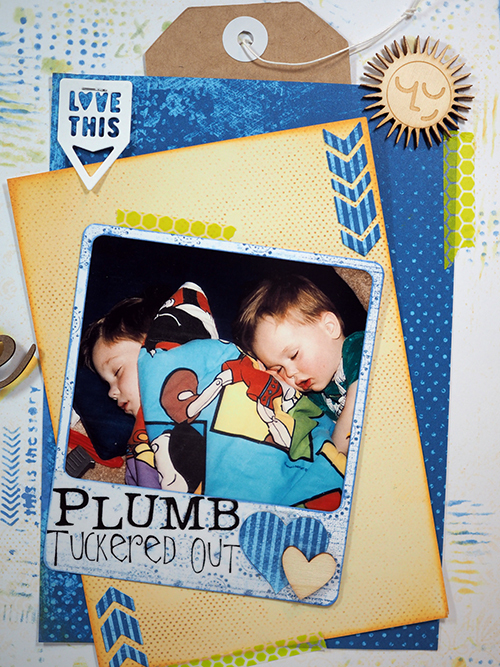 I doubled up with a slightly larger blue photo mat behind the yellow and then tucked in a kraft tag for journaling. I die cut the photo frame from MB101 and added the perfect Quick Quotes Vellum for my photo: Plumb Tuckered Out! 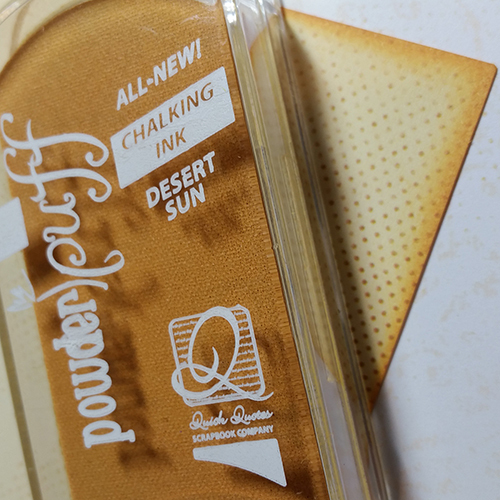 I am playing along with this month's Quick Quotes Challenge: Shapes. My shape is arrows (surprise!) and I was able to incorporate them with stencils, die cuts, and wood chippies! If you would like to join us (and hey - you know you want to!!!) you can find all the details HERE.